When the Children's League disbands, Ruby rises up as a leader and forms an unlikely allegiance with Liam's brother, Cole, who has a volatile secret of his own. There are still thousands of other PSI kids suffering in government 'rehabilitation camps' all over the country. Freeing them, revealing the governments unspeakable abuses in the process, is the mission Ruby has claimed since her own escape from Thurmond, the worst camp in the country. Los Angeles is in ruin, the former Children's League has been compromised and Ruby now finds herself as a reluctant leader of the children who have survived. Those who had vowed to keep the children safe have betrayed their trust and now the group need to find a safe house to plan their next move, with Clancy bound and gagged. They plan to use what minor force they now hold, to free the children from the oppressive prisons, gathering information and infiltrating Thurmond, the three thousand strong camp. Clancy's Project Snowfall research has now fallen into the wrong hands, and it seems the battle may be already lost before it's begun. But when old friends reunite, alliances formed and secrets revealed, sacrifices will need to be made. Attack with force, or employ the power of the underground media to reveal the atrocities of the rehabilitation camps. Ruby finds herself torn between keeping her monster at bay or offering herself to become the martyr of her generation, even it it means returning to Thurmond to fight her own battle... And not everyone will make it out alive. I enjoyed The Darkest Minds, I loved Never Fade but In The Afterlight was phenomenal. Ruby is now helping Liam's brother Cole, to gather the children and seek refuge. The former Children's League cannot be trusted and the group are left to make the long journey across the country to what could be the only safe haven that remains. With thousands of children still trapped within the camps, guards armed with high powered riffles and the President himself discounting their efforts as mere terrorism, all the small group of dangerous children have now is the will to survive. They've been beaten and broken, but realise this may be their only chance to live with freedom and without fear, in the hope for a future where they can return to their families. The freedom to live where we wanted to, with whomever we wanted to, and to not be scared of every passing shadow. For kids not to grow up with the fear that one day they might not wake from their sleep, or that they'd blink out like a light bulb in the middle of an otherwise normal day. The group are experimental children of their generation. Cursed with abilities that society have deemed dangerous, and the President decreeing those who have survived shall be forced to enter rehabilitation camps. Children aren't being rehabilitated and the only escape from the oppression is death. Ruby was one of the lucky few to escape, where the children are coded by colour to represent their level of ability and danger. She can violate your thoughts, only surpassed by Clancy, the former leader of East River and a teen with a dangerous ability himself. But the President's son is a liability, withholding information and had proven that he cannot be trusted, under any circumstances. I enjoyed seeing the role reversal in Liam's relationship with Ruby from that of typical young adult. He understands that she is capable of defending herself, but still worries about her nonetheless. I felt that Cole was the more dominant male lead and hides behind a strained and one sided banter with Liam. He carries an enormous weight on his shoulders. The new relationships that formed throughout the storyline were surprising, and fans of the series will rejoice at the return of a few favourites that have been assumed missing. One aspect that was missing from previous installments, was the inclusion of poetic passages verging on purple prose. I adored them. It provided a much needed softness within the storyline to balance the intensity. The Darkest Minds series may very well be the last of the incredible dystopians we'll see in young adult for quite a while. If you've yet to pick this series up, with all three books released, now is the perfect time. Alexandra Bracken is brilliant. You won't be disappointed. i've only read the darkest minds, and while it had an interesting concept, i wasn't too stoked. UNTIL THE ENDING? WHAT GOING ON OMG!!!!! i literally dropped the book in shock when i realized what ruby was going to do to liam. ugh. pains me to think about it. i'm really glad to hear that this series just gets better and i am really excited to see where things go with the next book. p.s. alexandra bracken is so sweet, it's funny to imagine her writing such a dark series?? It took me a while to get into book one as well, but by that ending that left me completely shocked. This series gets better and better with each book. You'll have to pick up Never Fade soon, I can't wait to see what you think of it. I'm late in the game with this series, but now would be the perfect time to read them since the trilogy is complete. Though the world sounds atypical of a dystopian setting, I'm curious to find what sets this one above the rest. The premise isn't all that different from your typical dystopian, but the characters and writing are incredible, so it really does set it apart from the rest. I can't wait to see what you think of it. I loved it too Jess. I was so excited when I read your review and seen how poetic the writing seemed. Especially among the destruction and dystopian setting. It's the only time I really enjoy lyricism. Overall, it's one of the best series finales I've read. You'll swoon, cry and read on the edge of your seat in parts. I can't wait to see what you think of it poppet. 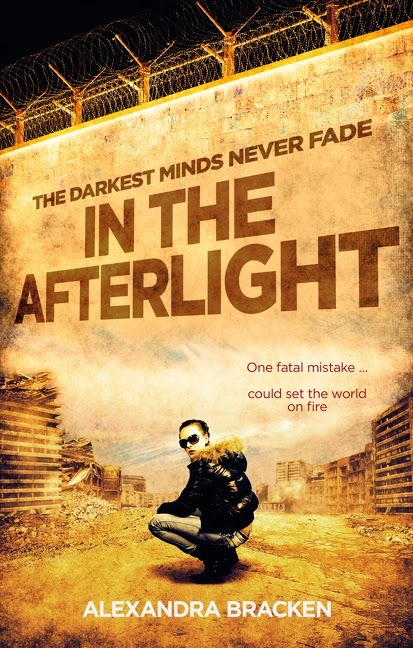 I like our cover better than the US one for In the Afterlight though, their one looks like a half eaten cookie. But their previous ones were nicer. You HAVE to grab a copy soon, then we can start a support group before we all nosedive into a Darkest Minds finale depression. Oooh, you have me hooked in already: I know I love books about children fighting against the government (though it sounds rather unrealistic when I put it like that...) so this is right up my alley. Thanks for the recommendation! Me too Heather. Anything with oppressive governments or regimes, and revolutions... That's a bookgasm right there. Have you read any good ones this year? I'm always looking for recommendations too. I haven't read anything by this author, but that's great you're loving these books. I was never really into the dystopian genre. I mean, I loved The Hunger Games, but besides that, I haven't read too much. You're really missing out Lauren, especially with series such as Divergent and even The Darkest Minds. I think you'll really enjoy the genre and there's so many incredible titles out there to choose from. Oh no Zoe, you HAVE to pick them up again! The series is just phenomenal! I'll have to nag you until I see you reading Never Fade. Trust me, you won't be disappointment! Can't wait to see what you think of it.